A new Steam Knight, Puzur-Ili Legion has been unveiled. [AUTO](RC):[Soul Blast (2)] When this unit attacks a vanguard, you may pay the cost. If you do, until end of that battle, your opponent cannot call grade 0 cards from hand to (GC). [AUTO](VC):[Counter Blast (1) & Choose a card from your hand, and put it into your soul] When this unit Legion, you may pay the cost. If you do, look at five cards from the top of your deck, search for up to one card from among them, reveal it to your opponent, put it into your hand, shuffle your deck, choose one of your opponent’s rear-guards with the same grade as the card put into your hand with this effect, and your opponent puts that unit on the bottom of his or her deck. [AUTO]:When this unit is placed on (VC), put two cards from the top of your deck into the drop zone, if those cards have the same grade, choose up to one card from among them, and put it into your hand. Today we’re introducing 2 cards from the 4th Clan Booster “Gears of Fate” (on sale September 30th, 2016), the 《Gear Chronicle》 Legion Units “Steam Knight, Puzur-Ili” and “Sorrow Divider Dragon”. “Sorrow Diver Dragon” has an ability when it’s placed on the field that it sends the top 2 cards of your Deck to the Drop Zone, and if both cards have the same grade, you can recover one of them. If you’re successful, you can increase your hand by one card for virtually no cost. If a key card for your Deck is falls into the Drop Zone, you can return it to the Deck for the cost of Legion. Also, its “Legion” ability allows you to Soul In a card from your hand in exchange for search for a card from among the top 5 cards, and then you can place 1 card among your opponent’s Rearguards back into their Deck, whose grade is the same as the searched card. You can virtually Retire troublesome Rearguards. 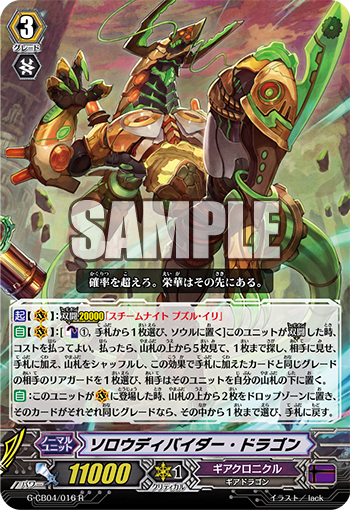 Also, “Steam Knight, Puzur-Ili” is a card that’s essentially the 《Gear Chronicle》 version of “Silent Tom”. In cases where you need just one more point of damage to win, this card can find major use in the end of the match! By using 《Gear Chronicle》 and Legion, you’ll be able to seize victory! And, “Vanguard Weekly News Bits” (at 9 PM JST) features cards from the anime including “Ryuzu’s ace card”! Be sure to watch “Vanguard Weekly News Bits”! !